I have FSC X and has installed no problems. The question I have is whilst there are a few formats the flight plan can be saved as (eg PMDG, VATSIM) is there a possibility that the FeelThere aircraft family can be included also such as Wilco's Boeing 7xx PIC series? originally we intended to integrate Wilco's flight plan format for the Airbus family into v. 8.3; but we flatly failed. It turned out that the Wilco format makes reference to their own internal database numbering which in turn depends on the currently loaded Airac cycle. Since we do not have access to Wilco's internal database structure, we finally gave up. We were then told by a user that we were hitting a strawman in that Wilco (at least the Airbus family) reads (and loads) Flight Simulator's own flight plan format. In this case the whole problem would disappear, since every FSC flight plan is automatically saved in FS format. I'm not sure about the Boeing series, but you might want to try it out. Thanks for the response. A pity this can't be done as I'm having problems getting Wilco/FeeThere aircraft to recognise imported flight plans into the FMC. Now the problem is not caused via FSC. Far from it. This program is terrific and creates FS Plans without a hitch. There just doesn't seem to be a solution getting them imported into the FMC of the B737 PIC aircraft and actually having that flightplan recognised as loaded and working. Oh well looks like the manual entry is the only method to make the FMC work. My name is watte Jansen, currently i'am flying a PMDG 747X in FSX. My Question is, is it possible to save te flightplan for the FMC in the PMDG 747X. I tried several options under Save As in combination with the PMDG737 and PMDG747 option. I Searched the forum's but i can't find any answers to mij question. unfortunately we do not understand what your problem is, since you don't say that. I asked this question before, about saving a flt pln into Wilco 777 FMC FSCommander 8.3. I havn't gotten a reply to it yet, but I see that their is no solution for the Airbus. Is this the same for the Wilco 777? Is this the same for the Wilco 777? I'am trying to save a flight plan from EHAM to WADD voor the latest PMDG 747-400X version. i like to load it in to the Flight Management Computer of the PMDG 747X (option Co-Route). The problem is that when i save the flightplan in FSC8 as EHAMWADD with the option pmdg 747, i can't find the flight plan in de folder C:\Program Files\Microsoft Games\Microsoft Flight Simulator X\PMDG\FLIGHTPLANS. I'am using Vista 32, FSX, and PMDG 747-400X. I can't find out whats my mistake. I hope the question is clear and you can help me. as far as I can tell, everything you do is, in fact correct, so that the flight plan should have been saved in the correct PMDG/FLIGHTPLANS folder. Since I'm using the PMDG all the time, I currently have no idea what's going wrong on your system. Since the PMDG flight plan must have been saved somewhere, could you please search your system for its location and tell us where it ended up. i searched my system for the file EHAMWADD.RTE and noting was found. I did the following, i reinstalled FS9 and reinstalled the PMDG 747 for FS9. I saved the flightplan in FSC8 as EHAMWADD with the option pmdg 747, and now the file EHAMWADD.RTE appears in the G:\Microsoft Games\Flight Simulator 9\PMDG\FLIGHTPLANS folder. I then copied the file EHAMWADD.RTE to the folder: Program Files\Microsoft Games\Microsoft Flight Simulator X\PMDG\FLIGHTPLANS and it works PERFECT! Thanks for the quick response, i hope to find out why the file doesn't show up in the Microsoft Flight Simulator X\PMDG\FLIGHTPLANS folder. A Solution for the problem saving FSC8 flightplans for the 747X PMDG using Vista32. 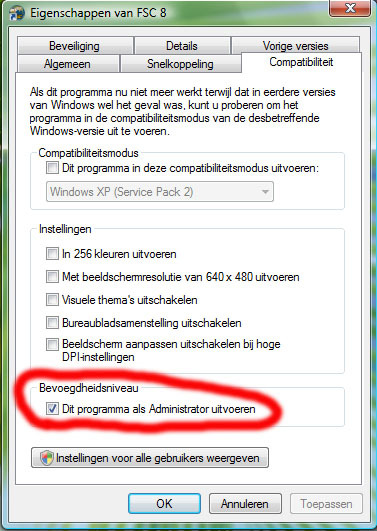 Right click on the FSC8 desktop icon, then select "properties", then select the tab "compatibility", then place a mark before the tekst "execute as administrator", ( see attached image). It solved mij problems with exporting FSC8 flightplans. If you are having the same problem's, i hope this helps! It uses FSX format flightplan so you have to point your saved FP to correct FSX FP folder. 1. Load FSX default aircraft on departure airport. 4. Set dep/dest airports on FMC. 5. Import flightplan on FMC. That's all, with a little aditional tip: if you change your aircraft from 737PIC and then go back to it, you will have the error message again. So you will have to close FSX and re-open it. Flight Plans created in FSC and saved as FSX plans into the default FSX plan directory in 'My Documents' can be loaded into both the PIC 737 and the Airbus Series 1 FMCs. I do it all the time as routine. There's no need for a separate save from FSC, unlike the Level D, which needs it's own format, and works great saved from FSC into its own plan directory.